There was something curiously familiar about the wrinkled little man. He was one of those people you see once and, because of their singular distinctiveness, you never forget. And yet, I had. With a few hours to spare before my flight back home, I was strolling along the sidewalk around Indianapolis’ Monument Circle. Once a dirty, bus-fume-choked city, the Hoosier capital had transformed itself into a sparkling tribute to urban renewal. I hadn’t walked that pavement since childhood. In most of a lifetime so much had changed. But amid the newness of the city were still a few reminders of the days my grandparents would bring me downtown as a child. Policemen still patrolled on horseback. The old neo-Classical Circle Theater, built in 1916, where my parents took me to see How the West Was Won and The Sound of Music, was now renovated to its former dramatic glory. The towering Soldiers and Sailors Monument that seemed a little less towering now but no less iconic, still proudly punctuated the Circle. Each one brought back warm memories. But then I saw the old man sitting against the wall of a department store just across the street from the monument. His legs were amputated at his hips. He sat on a simple square of plywood with wheels attached. A jar of pencils placed a foot or two in front of him offered a practical thank you to passers-by for their charity. I stopped a few yards away, staring, hoping he wouldn’t notice when an odd sense that I had seen him before surfaced slowly but assuredly from long-forgotten childhood memories. Was it possible that he had been sitting here in front of this department store all of these years? Or was my mind playing a Déjà vu trick on me? Could it be that while I grew up, went off to college, got married to a woman who loved me, raised five terrific children, and found a satisfying and rewarding career; he had sat in that same spot all that time — day after day after day — waiting for sympathetic shoppers to buy a pencil and help him make it through another day? I drew closer to him and noticed more clues that we had, indeed, met before. Both of his callused hands grasped blocks of wood that he used to propel himself along the city sidewalks. I remembered those worn blocks. And the glass jar of pencils. I remembered the pencils. And with that memory I recalled the compassion I felt for him when my grandparents explained to me that he sold his pencils to help him eke out his meager living. “Didn’t I used to see you here when I was a kid?” I asked. He smiled up at me. “I’ve been here over forty years. That was me,” he assured me. We talked for several minutes. 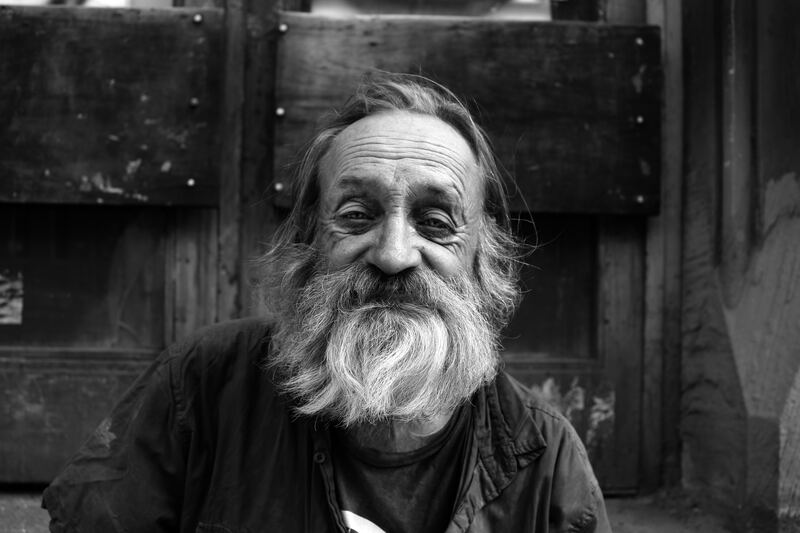 During our brief conversation he didn’t tell me how badly life had treated him. He didn’t complain about how uncomfortable the hot, humid summers or the frigid Indiana winters must have made him – though I’m sure he could have. Instead, he wanted to know about me. What brought me back to the city again after all these years. Who I was and where I was from. I told him about my grandparents taking me to Monument Circle where I first saw him. He seemed genuinely interested. I wanted to ask him how he had been able to live his life this way, but his dignity prevented me. All these years later I wish I had spent more time with him, expressing the same interest in him that he showed in me. After a while we said goodbye. I dropped a bill in his jar and chose a pencil to help remind me of our brief meeting and as a token of how, no matter what problems life threw across my pathway, I would likely never have to sell pencils on a corner to make a living. I walked to my car — something the old man had never had the privilege of doing. I returned home to my career and my loving family. I kissed my wife and hugged my children. And I thanked God for allowing a man with no legs and a jar of pencils to help me put my petty little problems in their proper perspective.